Winner Sports are an exciting new bookmaker who offer dedicated online sportsbook with pre-game and in-play betting on more than a dozen different sports and thousands of weekly matches, tournaments and events from around the world. New customers can get an array of bonuses and lots of exciting promotions, including money back specials on the big sport events. Find here all the details! WINNER SPORTS: DESCRIPTION Winner.com are owned by Redfinger Trading Limited and have developed a fine reputation in the gaming industry for their online casino, with the operator now teaming up with Playtech to offer a cutting-edge sportsbook with a mission statement to “create winners” and provide all customers with an entertaining experience. Always lots of exciting promotions, including money back specials on the big football matches are available on Winner Sports. You can find lots of live In-Play betting opportunities on a 24/7 basis, with the odds updating in real time. The Winner account can be used to switch between sports betting and the various other platforms, including the online casino and poker room. WINNER SPORTS: CURRENCIESAustralian Dollars (AUD), Canadian Dollars (CAD), Danish Kroner (DKK), Euros (EUR), Norwegian Kroner (NOK), Swedish Kronor (SEK), South African Rand (ZAR), Swiss Francs (CHF), UK Pounds (GBP) and United States Dollars (USD). WINNER SPORTS: RESTRICTED TERRITORIES Afghanistan, Antigua and Barbuda, Bahamas, Barbados, Belgium, Belize, Bulgaria, China, Cuba, Cyprus, Denmark, Domonica, Estonia, France and its territories, Greece, Grenada, Guyana, Haiti, Hong Kong, Jamaica, Iran, Iraq, Israel, Italy, Libya, Macau, Montserrat, Netherlands Antilles, Republic of Serbia, Saint Kitts and Nevis, Saint Lucia, Saint Vincent and the Grenadines, Spain, Sudan, Suriname, Syria, The Philippines, Trinidad and Tobago, Turkey and USA and its territories. WINNER SPORTS: DEPOSIT METHODSAll major worldwide credit and debit cards, Visa, Mastercard, Diners Club International, Electron, Delta, Skrill (Moneybookers), Instadebit, Neteller, Intercash prepaid card, Clickandbuy, Click2pay, Ukash, Swiff, Paysafe cards, Bank transfer, Ideal, eKonto, Abaqoos, Boleto Bancario, POLi, eNets, EPS, Teleingreso, Neosurf, Multibanco, Przelewy24, WebMoney, Moneta.ru, INSTANT Wire Transfer, Santander, Instant Bank Gluepay, Sofortüberweisung, Euteller, Bank Draft, Internet Banking, Dineromail and Entropay. WINNER SPORTS: WITHDRAWAL METHODSVisa, Mastercard, Entropay, Click2pay, Webmoney, Neteller, Clickandbuy, Instadebit, ECO and Bank Transfer. Cashout times are rated average, with one pending day and up to four days of processing time. WINNER SPORTS: FREE BETOpen an account with Winner Sports and receive exclusive special sign-up offer! You wil get an amazing 100% bonus which will get you up to £200 worth of free bets when you make a first deposit of £30 or more. The wagering requirements for this offer is 8 times your deposit and bonus before any winnings gained from the free bet bonuses can be withdrawn. Once you receive your free bet bonuses, they must be placed on selection(s) with odds greater than 1/2 (1.50) and no greater than 10/1 (11.00) to count towards your wagering requirements. New customers have 14 days from receiving their free bet bonus to meet the wagering requirements. Place a pre-match First / Last Goalscorer or Correct Score bet on ANY Premier League Match. If a Team wins from a losing position we will give money back and refund losing bets on that match. Place 20 separate in-play football bets to earn free bets! Place a 5-fold multiple and if 1 team lets you down, we will refund your stake as a free bet! Place 3 bets on Head to Head Golf Markets with 3 possibilites (e.g 3-balls, 72 Hole Matches) and we will reward you with Free Bets! Place 20 in-play tennis bets and get a free bet up to £10! Place 20 bets on US Sports and get a free bet up to £10! WINNER SPORTS: CUSTOMER SERVICEThere are a variety of ways that you can make contact with Winner.com, including email, telephone and live chat, although the latter option isn’t always available. You will get a quick and courteous response to any query and it won’t cost any money to call their Freephone number. 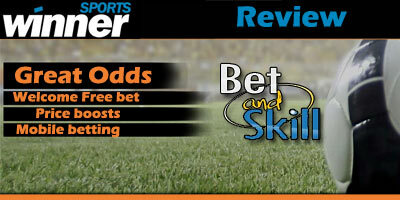 "Winner Sports review: up to £200 bonus, great odds, tons of free bets and high limits"